The Beddes Bunch: Craft Camp - Birdhouses! For some reason, this kid likes the color pink. This is the craft camp that he has been looking forward to all summer. He was pretty excited when I told him he could paint his birdhouse however he wanted. She just likes to be in on the fun and be just like all the "big kids." 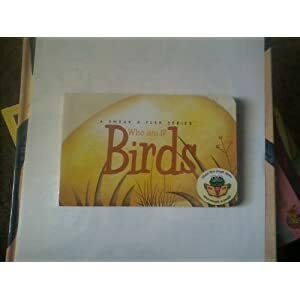 The kids had a great time pretending to be all the different birds in the book. This picture shows them demonstrating a pink flamingo sleeping. Why does a flamingo sleep while standing on one leg? It would fall over if it lifted the other leg! HA! HA! HA! For snack, we had rice krispie bird nests with eggs. Make rice krispies treats and while they are still warm, shape them into a nest. After they cool off, place a few M & M's or other round candies in the middle of the "nest." This week we got to do things a little differently. My 4 nieces were staying with us for a few days so I put each one of them in charge of an activity and we split into 4 groups and did centers. The kids loved it! In this center, the kids are playing "Which is different?" In each row there is one bird that is different than the others. The kids were instructed to place a rock on each of the birds that were different. Some are easier than others to figure out. In this center, the kids are putting together mini puzzles of birds. Some are kind of tricky. This one is a shape matching game. They had to move the yarn from the bird to the shape that matches the one on the birds belly. He must of painted over the yellow.